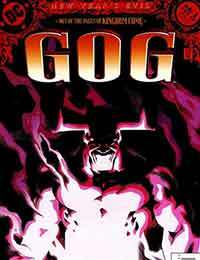 Gog (Villains) Average 0.00/5 - out of 0 total votes. Prologue to The Kingdom story arc.New Years Evil - out of the pages of Kingdom Come. Minister William constructs a house of worship to the Kingdom Come Superman, but a meeting with his god proves to be most enlightening in The Road to Hell. Appearances by the Phantom Stranger, Highfather, Shazam (the wizard), Zeus, a Guardian of the Universe.